Like many other countries in Europe, Slovenia suffered severe consequences during and after WWII. Many historians claim that WWII was the continuation of WWI, which had ravaged Slovenia and, in consequence, divided its territories and citizens. Before WWI, Slovenia was part of the Austro-Hungarian Empire. In 1915, Italy attacked Austria and opened the Isonzo Front, one of the cruelest series of battles during WWI, ending in the defeat of the Italian army at Kobarid (Caporetto). Hemingway wrote about the battle in Farewell to Arms. Nevertheless, Italy was on the side of the winners, and consequently gained vast territories of Slovenia, Istria, and Dalmatia according to the Treaty of Rapallo. The people under the Italian rule were soon subjected to the genocidal policies of the Italian Fascists that came to power in the 1920s. The novel begins in 1943 in the hinterland of Trieste that has been under Italian rule for more than two decades. The novel tells the story of Ada and Valeria, two friends who come from the same little village in the heart of the Brkini Hills near Trieste. Circumstances soon separate them. Ada marries an affluent psychiatrist who joins the Home Guard, while Valeria becomes a dedicated activist of the Communist-led Liberation Front. After the atrocities of the war, their children are brought up in the new Titoist Yugoslavia. Seventy years later, a brother and a sister must face the story of their unfortunate parents. They are torn apart, only to be joined by love. Cherry trees with their white blossoms and red fruit symbolize the nation, the division between the white Home Guard and the red Communists. Without taking sides, this national epic portrays the tumultuous history of a torn country and its people, the victims of wild ideologies. The historical background of the novel is thoroughly researched, as the author is Slovenian and aware of the terrible division of the Slovenian society dating from WWII. In April 1941, the Nazis defeated Yugoslavia and occupied northern Slovenia, leaving their Axis partners with the rest: the Hungarians took the east while the Italians annexed the south including the city of Ljubljana. Slovenian patriots organized a guerrilla fight within the Liberation Front, consisting of various political groups together with the Communist Party. Within two years, the Communist Party completely took over the national resistance movement and played dirty with anyone who did not suit its interests, namely, the revolution to establish a socialist state in the manner of the Soviet Union. Slovenian anti-communist militia, who opposed such course, emerged. Yet, lacking of material support of the Allies, they all ended on the side of the Axis as collaborators. The two factions — the Home Guard (Axis) and Tito’s Yugoslav resistance (Allies) — engaged in a bitter, fraternal fight that ended in 1945 resulting in massacres perpetrated by Yugoslav partisans. The novel first appeared in Slovenian language and had a huge impact on the social discussion as well as many positive critiques and media coverage. Hubert O'Hearn - author, reviewer, playwright and journalist. "Not three days earlier I had mentioned in a conversation with a friend that of all the independent, self-published books I have read and reviewed over the years, only three have really deserved to be signed to a major house's list. Now there are four. I bow to the excellence of Tanja Tuma." 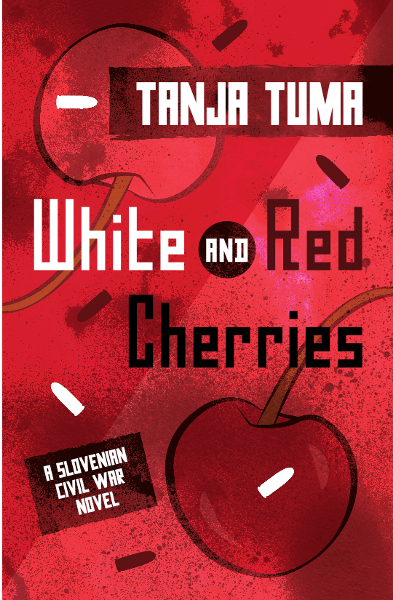 "White and Red Cherries, Tanja Tuma’s second novel, illuminates the complicated history of Slovenia during World War II and in the new Yugoslavia, offering a compelling picture of war’s hardship and its ongoing effects on survivors." "Tuma succeeds in threading the large-scale effects of war with everyday human problems. From secrecy and exile to shifting identities and border crossing, from marital distress to stolen joys, from loss to reconciliation, the narrative weaves a fascinating account of a central European country at a lesser-known juncture in its history." "A heartbreaking masterpiece. The destiny of a traitor’s son and a murderer’s daughter is rendered in eloquent prose. Without doubt, Valeria is the new grand personage in Slovene and world literature."